Making Strides Against Breast Cancer events raise awareness and money to save lives from breast cancer. And it all depends on you. The money you raise and the donations you make are helping the American Cancer Society fund innovative breast cancer research, 24/7 information and support, prevention and early detection initiatives, and so much more. 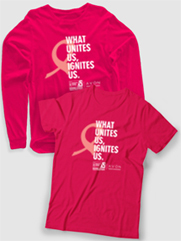 Please consider joining a Making Strides event and raising money or making a donation today. This fundraising kit has tons of information to help you reach or exceed your fundraising goals. The FUNdraising App is an easy way to raise more money and save more lives from breast cancer. It allows you to register for your event and ask for donations via email, text, and more. You'll also be able to accept donations seamlessly with a variety of payment methods: credit/debit cards, checks, PayPal, Apple Pay, and Android Pay. Here are tools to set attainable and achievable goals, come up with ideas and themes for fundraisers, then plan and implement them. We appreciate that you're giving your time, passion, and energy to ensure your fundraising and event is a success. One way we recognize your efforts is through our badges and the Pacesetter Club program. There are badges and clubs for both individual and team fundraising, along with badges to recognize activity and status levels. Grand Club members are recognized for their amazing help in the fight to save lives from breast cancer. Each member raises at least $1,000, and receives a T-shirt and badge as recognition of your efforts. Members of the Pacesetters Club have gone above and beyond, achieving extraordinary fundraising results for American Cancer Society Making Strides Against Breast Cancer walks by raising at least $2,500. Members receive special, year-round perks, which may include acknowledgement at Making Strides Against Breast Cancer events, recognition on the Making Strides website, a special gift, and invitations to local events. Making Strides Against Breast Cancer events depend on the generosity and hard work of participants and teams. Those who go above and beyond deserve recognition. After all, many of the American Cancer Society's lifesaving research and patient programs wouldn't exist without the help of volunteers and their fundraising efforts.